The southern hemisphere of Mars is home to a crater that contains very well-preserved gullies and debris flow deposits and he geomorphological attributes of these landforms provide evidence that they were formed by the action of liquid water in geologically recent time. When sediment on a slope becomes saturated with water, the mixture may become too heavy to remain in place, leading to a flow of debris and water as a single-phase unit. This is called a debris flow. Debris flows on Earth often cause significant material destruction and even human casualties, when they occur in built-up areas. During a debris flow, a mixture of stones, gravel, clay and water moves rapidly down a slope. When the sediment subsequently stops, it displays characteristic surface features such as lobate deposits and paired levees along flow channels. 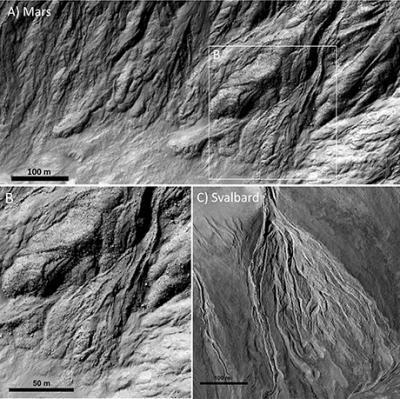 It is these landforms researchers have identified on Mars. The research group has been able to compare the landforms on Mars with known debris flows on Svalbard with the aid of aerial photography and field studies. The debris flows on Mars provide evidence that liquid water has been present in the region. "Our fieldwork on Svalbard confirmed our interpretation of the Martian deposits. What surprised us was that the crater in which these debris flows have formed is so young," says Andreas Johnsson of the Department of Earth Sciences, University of Gothenburg and principle author of a new article on the topic. Crater statistics allowed Johnsson and his co-authors to determine that the age of the crater to be approximately 200,000 years. This means that the crater was formed long after the most recent proposed ice age on Mars, which ended around 400,000 years ago. "Gullies are common on Mars, but the ones which have been studied previously are older, and the sediments where they have formed are associated with the most recent ice age. Our study crater on Mars is far too young to have been influenced by the conditions that were prevalent then. This suggests that the meltwater-related processes that formed these deposits have been exceptionally effective also in more recent times," says Johnsson. The study crater is situated in the mid-latitudes of Mars' southern hemisphere, superposed on what is known as the rampart ejecta of a nearby larger crater. A rampart ejecta display a "flowerlike" form around the host crater, and scientists have interpreted this as being the result of an impact in wet or ice-rich ground. "My first thought was that the water that formed these debris flows had come from preserved ice within the rampart ejecta. But when we looked more closely, we didn't find any structures such as faults or fractures in the crater that could have acted as conduits for the meltwater. It is more likely that the water has come from melting snow packs, when the conditions were favorable for snow formation. This is possible, since the orbital axis of Mars was more tilted in the past than it is today," says Johnsson.